Why is it assumed that you can speak for everyone in a group, or that everyone shares your preferences and opinions? This is an example of self-appointed decision making. A self-appointed decision maker, be it an individual or group, gives themselves the authority to make decisions on behalf of someone else. A simple example is when someone adjusts the thermostat in a shared space without determining whether other people want the temperature changed. Self-appointed decisions occur when someone either 1) prioritizes their own interests without caring about or considering the interest of others, 2) assumes that others share their own preferences, or 3) assumes that they have already understood and considered the interests of others. Organizations that tolerate self-appointed decision making tend to breed a culture of mistrust and unspoken narratives. When employees continually see leaders make even the tiniest of decisions without consulting others, it sends the message that their voices and perspectives don’t matter. 1. Question the assumption of consensus – One of the reasons self-appointed decision making is tolerated is because the decision is presented as incontrovertible. Imagine that during a heated discussion, one person declares, “Let’s agree to disagree and, for the sake of time, move on to the next item on the agenda.” The speaker provided no alternative, and instead asserted only one way forward. When this happens, rather than acquiescing to the decision, offer alternative perspectives that question the legitimacy of the decision. 2. Call it out – Many people simply are not aware that they are making unilateral decisions. Bring attention to the fact that they are deciding alone without considering others. 3. Invite others to share their perspectives – Sometimes, everyone is on the same page, but a self-appointed decision maker assumes this without testing it first. A good way to counter a self-appointed decision, and to either test or confirm consensus is to invite others into the conversation. 4. Speak up – Inviting others can be a great way to bring alternative perspectives into the conversation, but if you are the one who has the alternative perspective, don’t rely on others to be your voice. Develop the courage to directly challenge decisions that you don’t consent to. 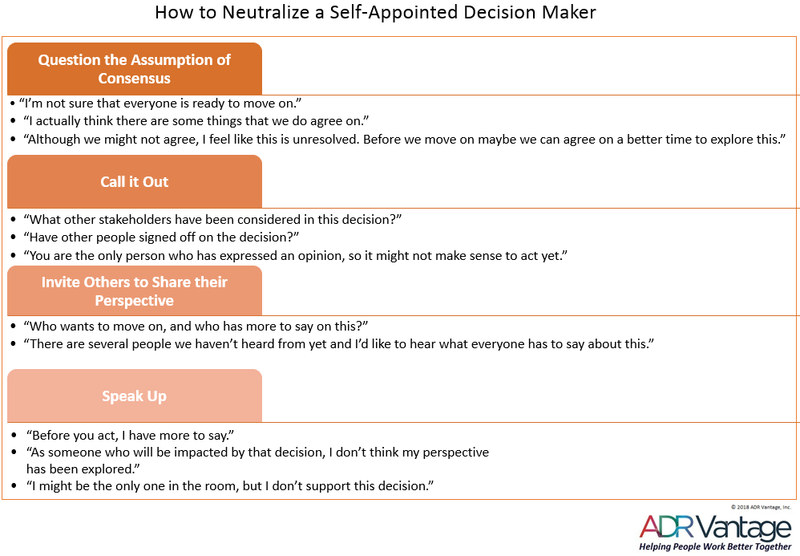 If you want to improve the effectiveness of your team’s decisions and foster a culture of trust, practice these alternatives to self-appointed decision making.